With the leaves changing and the weather turning colder, we decided to go camping and enjoy the night beneath the stars all cozy in our sleeping bags, inside our little tent. How I love camping, and the Peanut has joined my enthusiasm for it. 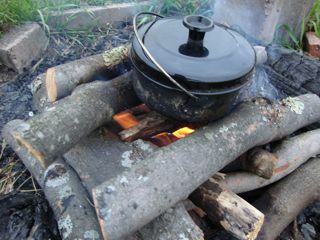 Be it collecting firewood, helping getting ready to go (ie packing the car) to mixing the pancake mix fireside to enjoy in the morning. 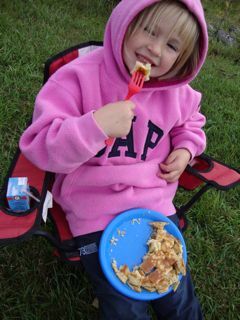 The Peanut is a trooper (like her Mom) and likes camping no matter the weather - even if its raining. It's the joy of being outside and excitement of being one with nature. Of exploring the sights and sounds and of indulging in the simple pleasures (like smores :). I have honestly never been camping in my life. Looks like you guys had a great time! We were supposed to go to visit my sister-in-law for her surprise birthday party, but all the flooding in southern MN blocked our path so we just sat home and hung out with the cats. That pancake looks nummy but huge!! 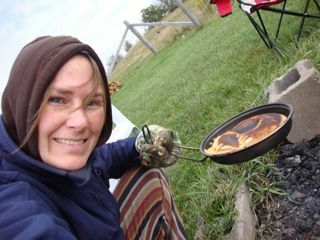 She's a pretty easy going sort, LOL, but warm pancakes sure help!!! Good time to go camping, not too cold or hot. Peanut looks happy...maybe it's the pancakes or the beautiful pink pullover that looks warm and fuzzy. I love camping :) Haven't been in such a long time... this post made me miss it. Hello there, I found you on blogfrog. What a lovely post and your daughter, elle est belle! oh ,I never go camping since I was in junior high hehehe. By the way I am following you from Indonesia just now.